10W LED GLS LAMP B22 BC 60W EQUIVALENT. Save energy up to 90% comparing with incandescent lamp. LongLife of 2500h, 25 times longer than an incandescent lamp, just fit and forget. Instant start up. 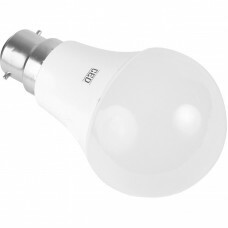 Same size as a GLS incandescent lamp for direct replacement. 60W equivalent, BC / B22 Cap.